The ice sculpture at W E Clark & Son pictured yesterday morning. 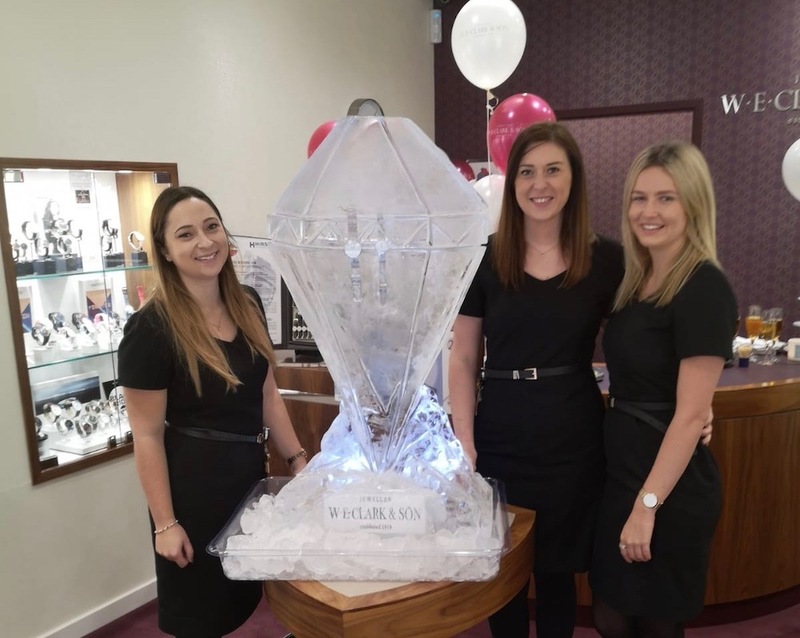 With it are three of the team at the jewellers, manager Charlotte, Kylie, and Lauren. 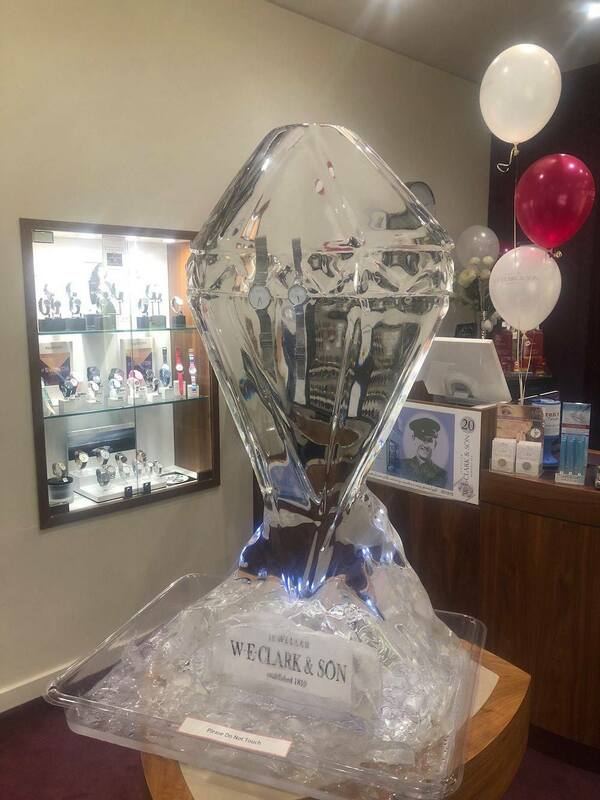 It was all happening at W E Clark & Son in Uckfield yesterday as the jewellers chose Black Friday to hold a Christmas preview event. If you peered inside the store you would have seen a fantastic ice sculpture in the shape of a diamond gradually melting throughout the day. Two Bering watches were frozen in place and people were asked to estimate the time they would fall from the ice, with the person closest to guessing the right time winning their own Bering watch up to the value of £199. In addition there was a 15% discount being offered on all purchases and the chance to enjoy a glass of Prosecco and nibbles while looking around. The Uckfield team were thoroughly enjoying the social buzz when an even bigger wave of excitement ran through the shop. Elizabeth and Tom Appleby, from Burwash, suddenly discovered they were winners of £500 to spend there. Winners of £500 at W E Clark & Son, Uckfield, Elizabeth and Tom Appleby are pictured with manager Charlotte Roake. Like all W E Clark & Son customers they were sent special invitations to the event. Each invitation contained a number to match with one displayed in the Lewes and Uckfield stores and the Applebys had the winning number. 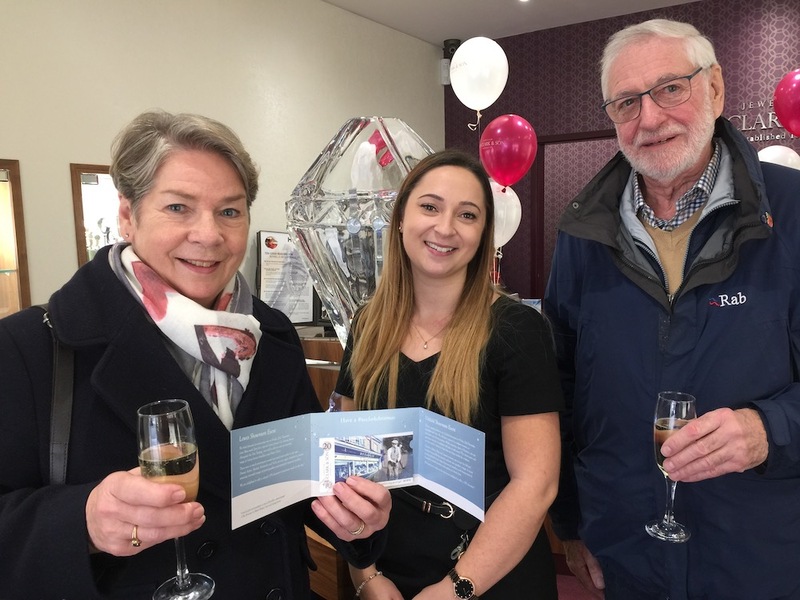 There was even more excitement when manager Charlotte told the couple they could add another 15% to their winnings to take account of the discount offered in store that day – that meant they had £575 to spend. She hadn’t a clue what they would buy, but said that as she had celebrated a milestone birthday recently, she thought she would treat herself. Tom, meanwhile, was thinking that as their luck was in he might buy a lottery ticket. She was pleased with the way the ice sculpture had turned out and the number of people attracted in, guessing when the watches would be released, and enjoying a glass of Prosecco while there. The shop closed at 7pm last night and, an hour before that it was announced on Facebook that the watches were still frozen in place. Those who entered time guesses were, first thing this morning, still waiting to hear who the competition winners were. The last picture posted on Facebook yesterday of the melting ice sculpture at W E Clark & Son, Uckfield. The exact times the watches fell are still to be revealed.